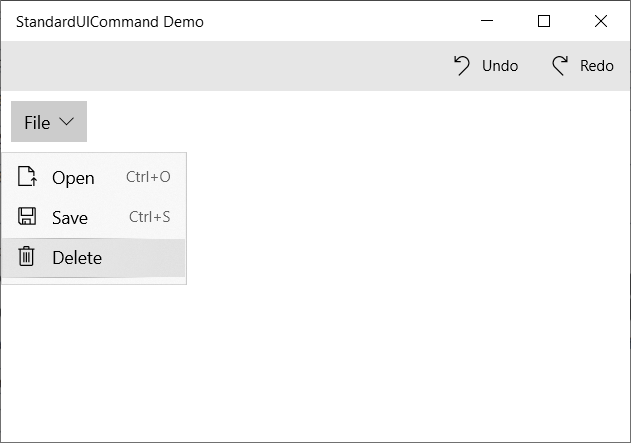 I have created a small demo page with a CommandBar and a DropDownButton (also new in the 1809 SDK). The CommandBar has 2 AppBarButton controls (Undo & Redo). The Command property of these buttons are set to a StandardUICommand with the Kind values 'Undo' and 'Redo'. The DropDownButton has a flyout menu with 3 FlyoutMenuItems in it. The Commands of these items are also set to a StandardUICommands. The StandardUICommand will set the Icon, Label/Text, Tooltip and KeyboardAccelerator of the button/item. It is great that the Kind property can now be set. This saves me a lot of work setting the Icon, Label/Text, Tooltip and KeyboardAccelerator of AppBarButtons and MenuItems manually.